When they reached adulthood, young men had to gain admission to a syssition, a band of soldiers who lived together and all contributed food to a common mess. Any man who was not accepted into a syssition lost his Spartan citizenship. The pressures on Spartan boys molded them not just towards physical hardiness but also towards conformity and obedience. The Spartan state needed soldiers who would follow orders without question, even at the risk of their own lives. Spartan women and girls had a different experience, but also in the service of the state. The rigors of the agōgē and losses in war put a strain on the population and Sparta needed strong women to bear the next generation of soldiers, so, unlike their sisters in most other Greek cities, Spartan girls were encouraged to exercise and participate in athletics. With men living in the syssitia, Spartan women were often responsible for managing the family’s property. This unusual way of life was sustainable only because of one other critical element in Spartan society: the helots. Very early in their history, the Spartans conquered the nearby territory of Messenia, which has some of the best farmland in Greece. The Messenians were absorbed into the Spartan state as helots: unfree laborers, though not exactly slaves. 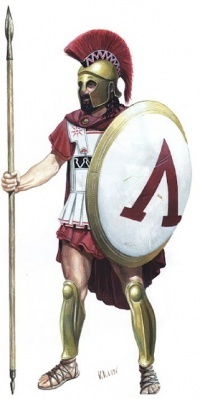 Helots could not be bought or sold, but they were required to farm their land and turn over half of what they grew to the Spartans, which provided Sparta with the food it needed to free up Spartan men to be full-time warriors and women to devote themselves to birthing healthy sons for the state. Keeping the helots under control was the number one priority for Sparta because without them, Sparta would starve. Every year, Sparta formally declared war on the helots, which meant that a Spartan could wound or kill a helot without legal or religious repercussions. Such violence was used to keep the helots in a state of terror. Helot revolts happened with some frequency, but the Spartans’ exceptional military skills made most such revolts short-lived. Sparta was locked into its militarism by its dependence on the helots. Having a large, unfree agricultural labor force made it possible for Spartans to dedicate themselves entirely to war, but having to keep that labor force under control also made that dedication necessary. Sparta is not just an example of a society of great soldiers, it is also a case of society which pushed itself to an extreme. That kind of extremism comes with extreme consequences. Spartan military excellence depended on the brutal oppression of the helots. It also created a culture of casual violence and conformism. Spartan men were conditioned from an early age to die rather than challenge authority. While in many ways Spartan women enjoyed freedoms that other Greek women could not dream of, those freedoms came at the cost of serving as breeding stock for the next generation of warriors. It is a powerful indicator of the pressures that Spartans lived under that only two kinds of people were allowed to be commemorated with individual gravestones bearing their names: men who died in battle and women who died in childbirth. This inflexibility served the Spartans well in their heyday, but as the world changed around them, Sparta was unable to adapt. When other Greeks and Macedonians adopted new tactics on the battlefield to counter Sparta’s hoplite forces, the Spartan army was very slow to change in response. By the time the Romans conquered Greece, Sparta was a quaint, backwards country village that was still putting its boys through a traumatically violent upbringing. Roman tourists could come to Sparta and watch boys going through the bloody rituals of the agōgē just like their ancestors had done centuries before. This is an important lesson for worldbuilding: extreme societies have extreme consequences. Pushing any aspect of a culture so far changes the rest of the culture around it. Not every warrior culture has to function like Sparta, but you can’t create a society so focused on its military capabilities without substantial effects on the rest of their way of life. Many of these effects may not be visible at first glance, just as when we think of Spartan soldiers we tend not to immediately think of the helots who labored to support them, but you can’t create one without the other.